Lewis is a genius, but lives in an orphanage where prospective parents cannot see how smart and special he is. He decides that his mother who gave him away as a baby must be the only person who could love him. So he sets out to make a memory scanner for the school science fair that will show him his mother so they can be reunited, come on why build a volcano when you can build a memory scanner. Sadly for Lewis a mysterious man with a bowler hat from the future steals his invention. Along with Dor-Is, a robot bowler hat, the man attempts to claim the invention for himself. To help Lewis reclaim the memory scanner is Wilbur a boy from the future and the son of the inventor Cornelius Robinson. 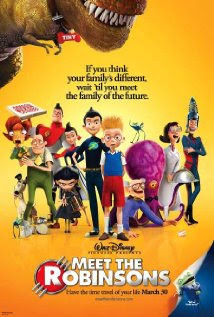 Wilbur’s dad in fact is the future’s most productive inventor and his creations have shaped the future. Wilbur takes Lewis into the future hoping he can help him reclaim a time machine stolen by the man in the bowler hat when he left the garage door open (seriously who hasn’t this happened to). For Lewis the most interesting discovery in the future is Wilbur’s interesting, okay weird, but supportive family. Will Lewis be reunited with his mother? Will Wilbur get the time machine back before his dad gets home? Who is this man in the bowler hat? And will Wilbur’s and Lewis’ choices lead to a very different and scary future? I love this movie. Seriously, this is one of my favorite Disney movies of all time and to be honest I can’t believe this movie has not been raised to Disney classic level. To me this is a movie that Walt Disney would have loved and could have produced. It puts a high value on family, it’s imaginative and it’s optimistic. Wilbur teachers Lewis his dad’s biggest catch phrase, “Keep Moving Forward.” It’s one that captures the spirit of Walt Disney, especially as one studies Disney’s story of success including his failures and predictions that his Mickey Mouse Park would fail. To make this connection overt, the end titles include this Walt Disney quote, “Around here, however, we don't look backwards for very long. We keep moving forward, opening up new doors and doing new things, because we're curious... and curiosity keeps leading us down new paths.” This movie truly has the feeling of the spirit of Walt Disney which you can find living today in a visit to a Disney park. Also throughout the movie are Easter eggs that return us living Between Disney to the parks and other Disney experiences. 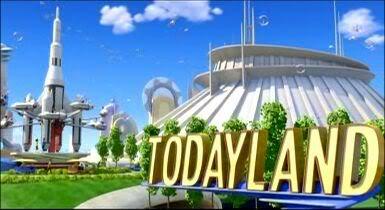 My favorite is Todayland. As Wilbur and Lewis fly through the future city they pass Todayland. When I first saw this I could not help but notice the iconic profile of Space Mountain, instantly connecting Meet the Robinsons with Tommorrowland. It led me to look closer at the shot in future views, seeing a version of the Astro Orbiter and unmistakably getting the subliminal message of “Plan a Vacation!” In another scene the man in the bowler hat and Dor-Is scheme to defeat Cornelius in a diner. The wall paper behind the conspirators features an image of Cinderella Castle. Finally, in a deleted scene the Robinson family robot Carl hands Wilbur a note on Winnie the Pooh Stationary.